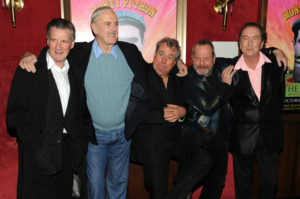 WASHINGTON — The famous British comedy troupe Monty Python has lost a court battle with a disgruntled ex-member. Reuters reports  that the troupe lost an amount of at least 200,000 pounds (or $300,000) due to the court ruling, which sided with Mark Forstater. Forstater helped produce the 1975 film “Monty Python and the Holy Grail”, which film was used to produce the Broadway hit musical “Spamalot”. Forstater said that he had not been adequately paid and reimbursed for his efforts, and was glad that “justice has prevailed”. He said he was the “seventh Python”, a claim that the other Monty Python troupe members dismissed.